In this webcast, Dr. Wallace will give an overview of the services offered by the RESNA Catalyst Project. He will define the services and devices of assistive technology and describe the benefits of assistive technology such as independence, community living, and employment. People with MS are a qualified and experienced group of workers. Experts estimate the current rate of labor force participation among Americans with MS to be between 30% and 45%. More than 90% of Americans with MS have employment histories with two thirds working at the time of diagnosis. Half of all people with MS stop working within the first five years of diagnosis. However, some 75% of unemployed people with MS feel that they would like to return to work, and more than 80% believe that they are able to work. Archived Webcasts - Did you miss one of our webcasts? Be sure to check out our 2014 Webcast Series. 2015 Series - Our 2015 Webcasts will be announced soon! 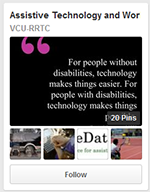 The VCU-RRTC is funded by the National Institute on Disability, Independent Living, and Rehabilitation Research, grant #90RT503502.